Littlefinger’s brooch on his doublet is a mockingbird, the personal sigil that Lord Baelish has taken for himself. His colors, though muted, have some flair to them. 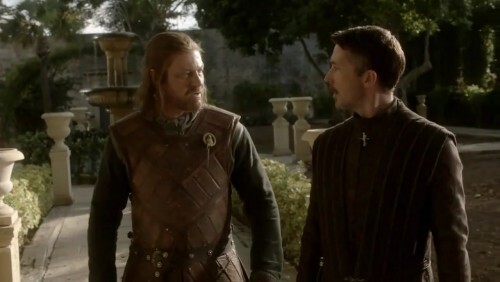 Especially in regards to the long, robe-like garment- Ned, on the other hand, seems to be wearing the same armored leather surcoat that his guards wore in Winterfell, suggesting a readiness for trouble.